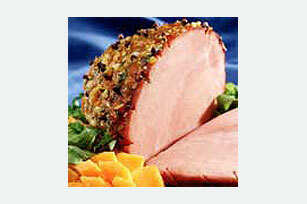 Pureed mangos and honey mustard are blended with onion, brown sugar and cilantro to make a delicious fruit-flavored glaze and sauce for baked ham. Cook and stir onion in oil in medium saucepan 2 to 3 min. or until tender. Stir in brown sugar; cook 1 min., stirring occasionally. Add mango and mustard; stir until well blended. Cook until heated through, stirring occasionally. Remove from heat; cool slightly. Stir in cilantro. Score ham by making shallow cuts across the surface; insert cloves into corners of scores. Place ham in roasting pan. Add 3 Tbsp. water to pan. Bake as directed on ham package, brushing with 1/2 cup of the glaze during last 20 min. of the baking time. Cook remaining glaze in saucepan over medium heat, thinning glaze to desired sauce consistency with water. Serve as a sauce with the sliced ham. You will need 2 or 3 pitted peeled medium mangos to get 3/4 cup pureed mango. Substitute chopped fresh parsley for the cilantro. Using a sharp knife, make 1/4-inch deep parallel cuts in the top surface of the ham, about 1 inch apart. Make additional scores at right angles to form diamond shapes.